Originally published under the title "Gulf of Aqaba Treaty: a Saudi Repudiation of the Camp David Accords." After more than a year of a heated debate, Egypt finally ceded two small Red Sea Islands to Saudi Arabia, giving KSA control over the Straits of Tiran and the Gulf of Aqaba. These waterways separate the Sinai Peninsula from the Arabian mainland and portions of the coastline are owned by Egypt, Israel, Jordan, and Saudi Arabia. Giving ownership of Tiran and Sanafir Islands and control of the gulf and straits to Saudi Arabia is a strategic mistake and a security threat for five reasons. 1) Almost every regime in Saudi Arabia has furthered expansionist, imperialistic agendas. Historically, Saudi rulers have attempted to lead the Muslim Umma (nation) by conquest or political and religious imperialism. King Salman bin Abdulaziz Al Saud's seizure of power in 2015 wasn't smooth, there were and still are attempts to overthrow him. The Saudi internal conflict will most likely escalate after King Salman's historic precedent to move the Saudi succession from the house of Abdulaziz ibn al-Saud to the house of Salman. King Salman may believe that asserting his territorial control of Gulf of Aqaba will help him strengthen his domestic position by increasing his regional and international power. Whether the Tiran treaty, and succession coup stunt works or backfires is yet to be seen. Nearly all Saudi rulers have furthered a religious imperialistic agenda. 2) King Salman has allegedly agreed to a portion of the Camp David Accords, which guarantees Israel unfettered access through the Straits of Tiran. This acquiescence creates a serious catch-22 for the King. While the deal increases King Salman's regional power, an agreement with the Jewish state threatens his domestic authority, because he is bound by Islamic Sunni jurisprudence. For example, the Saudi view of treaties with Israel was expressed by King Salman supporter and Saudi celebrity Sheikh, Salman al-Ouda. When Mr. al-Ouda was asked about the legitimacy of treaties with Israel, he answered with a Fatwa issued in 1988-1989 and signed by 60 Sunni scholars. It declared jihad against Israel adding, "under no circumstances is a person or an entity to recognize Jewish authority over any fraction of the land of Palestine." If King Salman were to actually abide by any element of the Camp David Accords, his rule would become illegitimate according to Saudi Arabia's fundamentalist Islamic system. These are the views Saudi rulers indoctrinate their citizens to adopt as the sole legitimate Islamic position towards Israel. 3) According to the Sunni Saudi narrative, suicide bombings against Jews and non-Muslims is a legitimate form of dissent. For example, a member of Saudi Arabia's Supreme Council of Scholars and advisor at the Saudi Royal Court, Abdallah Ibn Man'a, previously stated in an official Fatwa, "The best form of jihad for Allah, is martyrdom in his cause. Whoever dies in such an operation, is a martyr." Saudi Arabia's King Salman (left) and Egyptian President Abdel Fattah al-Sisi in Cairo, April 8, 2016. Moreover, Saudi Arabia indoctrinates its security officers into adopting the belief in suicide bombings. For example, former security police officer and current Muslim sheikh Sami bin Khalid Awad el-Hamoud received his Master's degree in Islamic jurisprudence from King SaudUniversity in Riyadh. His thesis was titled, "Suicide Operations: Its Forms and Its Jurisprudence," where he argued that any region governed by non-Muslim laws is a "house of war," where jihad in all its forms should be exercised. Since Salman has never shown any intention of abandoning Islamic jurisprudence, which is Saudi Arabia's raison d'être, his only solution under Sunni theology would be to officially agree to the accords, but unofficially continue to support militant Islamic activities. 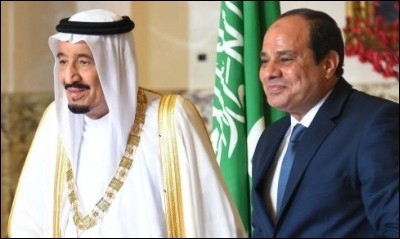 It's puzzling why Egypt and Israel would agree to further associate with King Salman, who was accused by German intelligence of financing terrorism in Pakistan and Bosnia. While Israel is officially granted freedom of passage in the Gulf of Aqaba by the Camp David Accords, there is absolutely no evidence that Salman will abide by the accords or that he would not abuse his power in the Gulf of Aqaba. This would deeply endanger both Egypt and Israel. 4) The possibility that King Salman will facilitate a jihadist migration into Sinai, given his history as a terror financier, is not far-fetched. The presence of more jihadists in Sinai would endanger both Egypt and Eilat. Sadly, this scenario is likely given the fact that KSA plans to build a bridge linking Sinai to Arabia. Many have taken KSA's newfound control of the Gulf of Aqaba at face value and celebrated it as a Saudi adoption of part of the Camp David Accords. The treaty should be more accurately viewed as a Saudi repudiation of the accords, given the negative possible outcomes for both Egypt and Israel's security. A warning about Saudi control of Tiran and Sanafir, was communicated in a 1957 CIA intelligence brief titled, "Prospects of an Armed Clash in the Gulf of Aqaba." 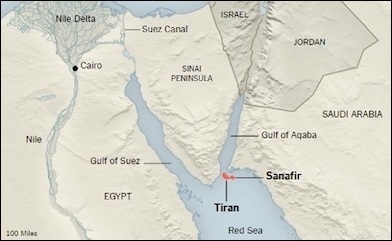 The brief warned -- "Saudi Arabia, which controls the east coast of the Straits of Tiran, could conceivably take unilateral action to prevent entry of Israeli or Israeli-bound vessels into the Gulf." The briefing continued, "In the event that Saudi forces were to occupy the islands they might attempt to control shipping through the straits of Tiran from positions on the islands." It's still 1957 in Saudi Arabia, and if Salman and his son are overthrown, the possibility of replacing them with an Iranian friendly option, such as Prince Ahmed bin Abdel Aziz al-Saud, would mean that a Saudi-Iran coalition could be created. 5) Signs of other security concerns caused by the treaty have already begun to manifest. The Muslim Brotherhood's Turkey-based Egyptian Revolutionary Council (ERC) has basically declared jihad in Gulf of Aqaba in an official statement on its official Facebook page. The ERC called upon Egyptians living in the cities overlooking the Red Sea to "struggle to liberate" the islands and the Gulf of Aqaba and treat them as "occupied territories." 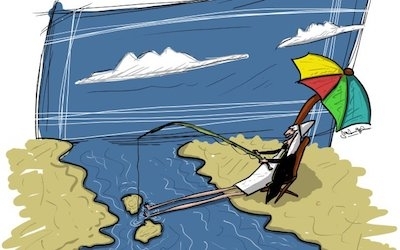 Giving ownership of Tiran and Sanafir Islands to Saudi Arabia is a strategic mistake. In another veiled call for terrorism, the statement also urged citizens to "treat all Saudi companies and institutions, as occupying forces." Not only does this destabilize Egypt's security, more dangerously it can inspire a coup d'état in Egypt. A coup could be launched with the excuse of defending Egyptian land, which may work given President el-Sisi's plummeting popularity after the treaty signing. The issue of the Red Sea islands is part of a broader and reoccurring question of whether or not the free world should be making deals and treaties with Islamic theocracies. The international community would be well advised to refrain from further official treaties with Sunni and other theocratic nations, until these regimes reform their governments and recognize the modern international laws and treaties, to which they have already committed. Until that time, it is irresponsible to make treaties, which have repeatedly backfired. Saudi control of the Gulf of Aqaba, is almost as dangerous to regional peace as President Barack Obama's Iranian nuclear deal. Cynthia Farahat is a fellow at the Middle East Forum and a columnist for the Egyptian daily Al-Maqal.